Dan’s Fish, Inc., sources the fine caviar delicacies from various freshwater fish species belonging to the Salmonidae family. 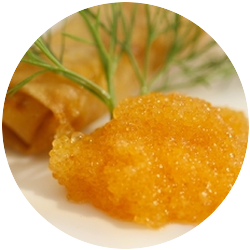 Whitefish Caviar (sikrom/siianmäti), Lake Herring/Cisco Caviar (löjrom/muikunmäti) and Salmon Caviar (laxrom/lohimäti) originate from the pristine North American Great Lakes. The delicate pearls of the caviar are often served as an appetizer on a toast coated with creme fresh and garnished with finely chopped fresh onions and fresh dill. 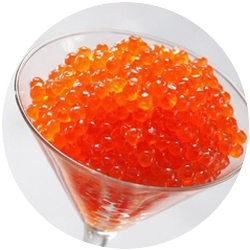 The flavorful, slightly salty caviar is also used in sauces and spreads, or as a garnish for hors d'oeuvres, salads, and fish dishes. 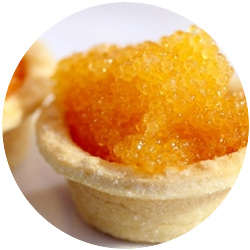 The addition of this buttery caviar gives any dish a special touch and appearance.